Though the equipment and supplies required to lubricate a chain the way they do are surprisingly inexpensive, the process is extremely time-consuming. What follows is a process you can follow to achieve the same result, but without the specialized equipment they use (instead, we’ll do similar, but more time consuming work with much more inexpensive equipment). Given the time involved (even with specialized equipment), I think their price is quite fair, but for those of us with more time than money, or those of us interested in re-applying the lubrication after the initial 350km they say their lube is good for, this article is for you. 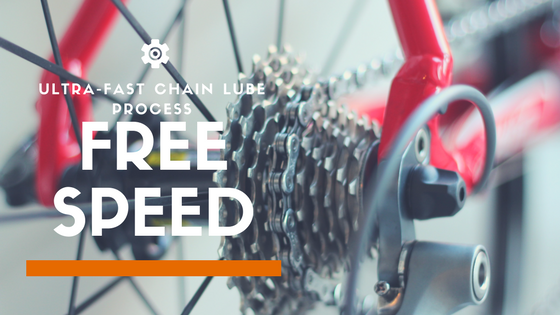 OK, so it’s not quite free, but it does work out to pennies to apply this lube process to a chain, and since you need to lube your chain somehow anyway, I’m calling it “free”. Paraffin wax (1lb is said to do 8-20 chains depending on who you ask. I haven’t done enough yet to know, but I have done four and used nowhere near 1/2lb). 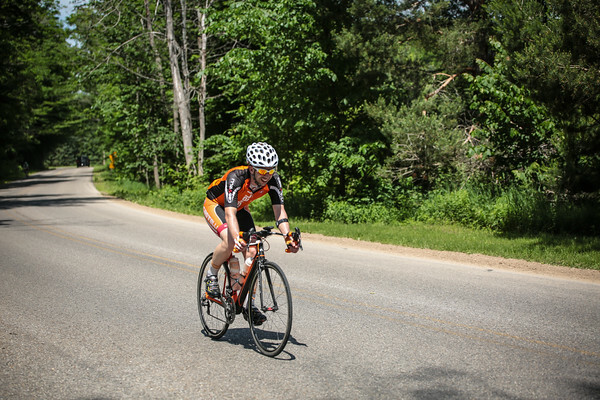 If you’re doing this with an old chain, then you’ve got this covered. If you’re starting from scratch, you’ll have to decide what chain to buy. Unless you go with a Wipperman chain or a 10 speed KMC chain, I highly recommend picking up some YBN quick links. They’re reusable (5x) unlike the KMC and SRAM 11-speed quick links and they’re reasonably-priced, unlike the Wipperman quick-links. CeramicSpeed uses a KMC X11-SL. They don’t state why, so this may be friction-based, longevity-based, or simply cost-based. Wipperman chains come with a reusable quick-link. 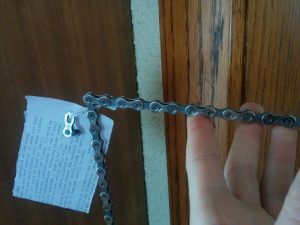 All other 11-speed chains either come with a joining pin or a one-time-use quick-link. YBN quick-links can be used on any chains. For the bedding-in process, a reusable 10-speed KMC link works fine on an 11-speed chain, but it feels a little lose, so I wouldn’t ride outside that way. CantitoeRoad did some durability testing in 2010 on 10-speed chains and determined Wipperman chains were the most durable, followed closely by Campagnolo, then distantly by KMC and Shimano (except the HG-X 74 which wore almost as well as Campagnolo Record), then SRAM. Sadly, I can’t find similar testing for 11-speed chains. Manufacturer-claimed weights: Campagnolo Record: 245g, Shimano CN-HG901: 243g, SRAM PC-RED 22: 242g, KMC X11-SL: 256g, Wipperman Connex X11SX: 270g. All that in mind, I go with the Campagnolo Record chain with a YBN link and I do both run-in steps (beginning and end) with a KMC 10-speed link. Whichever chain you pick, run it in for about 30min with the manufacturer-applied lube on an indoor trainer. This will free up any bits caught in the rollers during the manufacturing process. CeramicSpeed uses two ultrasonic cleaners in their process. Those can be quite expensive, and, though they’re high-tech, they’re not necessarily the best things to use, they just require less human interaction while in use (turn on, drop chain in, come back a few hours later–our device will require much more work, but perform better). We only need one of these. We replace their second ultrasonic cleaner with a slow cooker and a stirring implement. 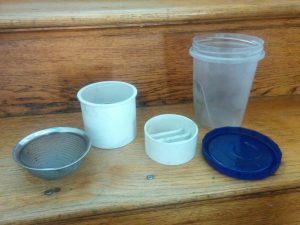 Start by taking the handle off your strainer basket and cutting the PVC to length (one short, one long, total length almost fills the container). I managed to find two fittings that were perfectly sized rather than a length of pipe, and as a bonus the short fitting has a grating on it that comes in handy to separate my chain from quick link when cleaning. Two options for assembly: If you managed to get a fitting with a grating like I have here, put it in the container first grating facing up, then the other piece of pipe. The chain will go inside the upper pipe and sit on the grating. Then add the strainer basket on top and your quick link will sit inside that for cleaning. If you’re just using straight pipe, then put the small pipe in, then the strainer basket, then the large pipe. Both chain and quick link will sit on the strainer basket for cleaning. 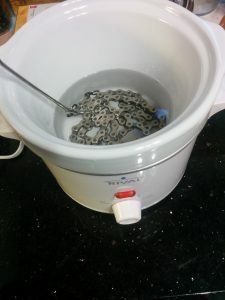 Put the chain and quick link in your DIY cleaner with enough non-polar solvent to just contact the bottom of the chain. Screw down the lid tight and shake vigorously for 5min. Wipe and hang to dry. Degrease with a strong degreaser (I used Simple Green 1:1 dilution), stirring regularly until you stop seeing oil come to the surface, or about 20min whichever is longer. Wipe and hang to dry. 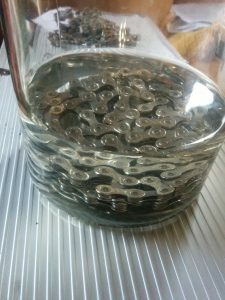 Put the chain in your glass jar and fully cover the chain with isopropyl alcohol. Soak for around 8-12hrs, agitating several times (shake it any time you walk by). Wipe the chain down. When you’ve finished, your chain will look cleaner than you’ve ever seen any chain ever. When you wipe it down with a white cloth, the cloth should come out looking spotless just like you see on the right here. 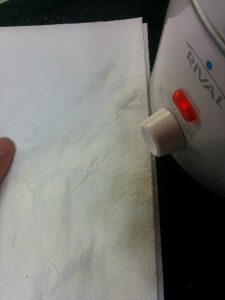 If you have any grime on your cloth, repeat the entire cleaning process. If you have any oily residue, repeat the degreasing and alcohol bath steps. Hang the chain to fully dry. After this step the clock is ticking. You’re down to bare metal, so the mild steel in your chain may start to rust. I wouldn’t leave it more than about 24hrs before moving on to the next step. In a slow cooker on low heat, melt paraffin wax. This may take several hours. Once the wax is fully melted, add 5g PTFE and 1g MoS2 per 1lb mixture and mix well. We need to get the chain up to temperature so the wax doesn’t solidify on contact with it and instead penetrates into the rollers. 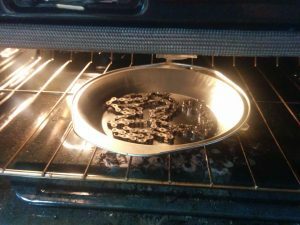 The easiest way is to bake the chain at 200F for an hour to get above the paraffin melting point. The temperature here isn’t critical. Paraffin melts at 99F and has a flash point of 390F, so somewhere in that range will work fine, but I’d try to avoid either extreme (too low and the chain may cool before it hits the wax and lose the desired effect–too hot and you might burn down your house). Transfer both the chain and quick link to the wax lube mixture (careful, they’re hot!) and stir for several minutes until bubbles stop forming, or around 10min, whichever is longer. Remove the chain, wipe it down to remove excess wax from the outside (it’s the wax in the rollers we want! ), and hang the chain up somewhere to cool. Turn the heat off on the slow cooker, your wax will harden and you can save it for the next chain. Once the wax sets, the chain will be quite stiff. Bend each link a few times to break it free all the rollers. Finally, you just need to run in the chain again on indoor trainer for around 30min to get it moving perfectly. This will throw small pieces of wax shaving all over the place, so if you are intending to use this chain right away, you may just want to put it directly on your bike. Just understand that if you do, it’ll take around 30min to shed that excess wax and leave you with a smooth-running, ultra-fast chain.